This recipe comes in handy when wanting to add a little colorful decoration to your desserts without compromising with dangerous food dyes and corn syrup candies. 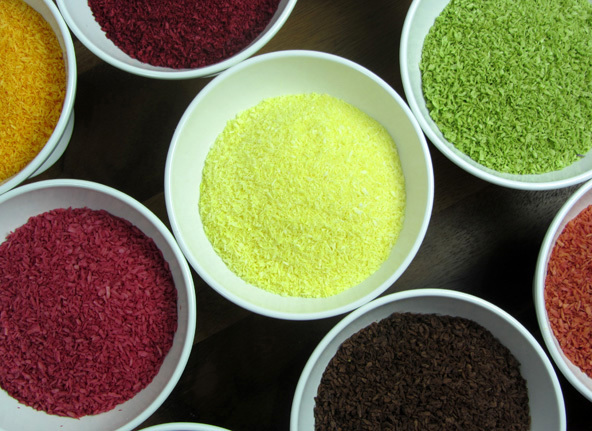 With desiccated (shredded and dried) coconut being so white, it can be colored with the juice of vibrant colored fruits and vegetables. 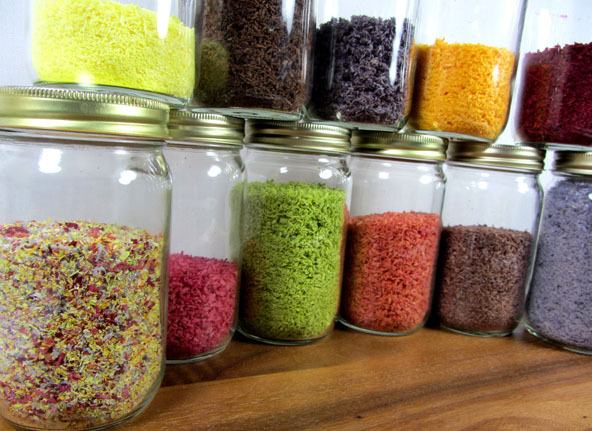 I use Coconut Sprinkles mostly for Easter desserts. 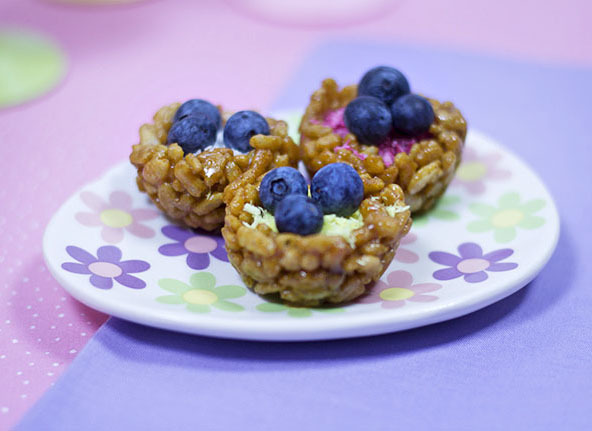 Here I used coconut sprinkles to make bird’s nests with my Whole Rice Crispy Treats recipe. Desiccated coconut, (dried) full fat, grated, shredded or flaked depending on the size and shape you prefer. Never use reduced fat, it doesn't hold the color any better and it taste like shredded cardboard. Purple: Blueberries, pureed in a blender, not juiced. You need the color from the skins otherwise it will be colorless. I tried grape juice and it did not keep the color well at all. Green: I made this with spinach juice and of course it tasted terrible. Even lemon juice and stevia could not mask its worse than grassy taste. I did use it however for a non-edible use. I put beans in the bottom of a small clay pot and used it as the grass on top and put a bunny cake on a stick in it for Easter with a ribbon around it. I don't suppose Chlorophyll Extract (in a dropper bottle at Health Stores) would taste any better. I think I'll just pass on the green thank-you, unless someone else has the answer. Blue: Haven't found the color yet. Fresh blueberry juice did not have enough blue – the blue is mostly in the skins. Purple cabbage turns blue, but I'm pretty sure that would taste worse than spinach. Bleh. Believe it or not the rest of the coconut sprinkles tasted great, even the beet juice. I suppose because it has a sweet base as it is used to make beet sugar. But then I also love beet juice in my fresh vegetable juice. I would caution you on using turmeric powder for the yellow though. I don't know how Seelect brand food coloring gets away with using turmeric and making it taste good but it does. And be aware that although annatto is not considered one of the "Big Eight" allergens (cow's milk, egg, peanut, tree nuts, fish, shellfish, soy, and wheat) it does rate number 10. It is the natural food coloring used in making cheese yellow-orange. In a mixing bowl much bigger than the amount of dried coconut you are using, add the dried coconut. Juice or puree your coloring of choice. Mix a tiny amount of lemon juice and stevia together and add it to each batch. Add in a little of your coloring at a time and stir together with a spoon until you like the color and there is no excess liquid in the bowl. Use full strength if you want the richest color. If there is excess liquid you can strain out the excess through a strainer. If you want a lighter color, mix the juice or puree with some water before adding to the coconut for even distribution. I found that if it is darker than you want, you can add more water and then strain out the excess coloring through a strainer by pressing the water out with the back of a spoon. Pour the damp colored dried coconut onto a baking pan with sides and place in the oven. It should not be so wet that you see water on the pan. No need to preheat the oven first. Turn on the oven to 220 and let dry for 15 minutes. Stir the coconut around for even drying and reduce oven temperature to 210 and timer for another 15 minutes. Stir once again, turn off oven and let it continue to dry in the oven until it is cooled. If it is not completely dry, put it back in the oven for another 15 minutes at 210. I found that you cannot speed it up in the oven by setting the temperature up over 230 because it will toast it and you will loose your color. It tastes great toasted but it's not pretty at all. I tried it in the dehydrator but the fan blows the coconut around too much. If you want you could put them in the oven at 200 degrees F. or less and keep them in all day like a dehydrator (I think, but I haven't tried it). Just before sprinkling on your special dessert, consider grinding the coconut up a bit in a small coffee grinder (one not used for coffee). If you do this it not only makes smaller sprinkles but brings out a sweeter taste to your sprinkles and makes it more moist. If you've tasted coconut butter before, this is what it will taste more like. Yummy! 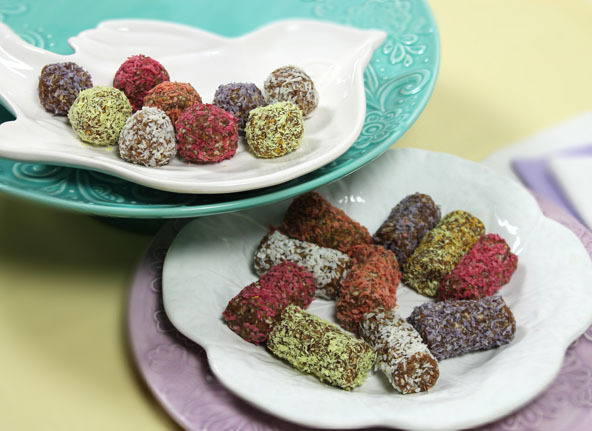 Colorful Coconut Sprinkles work great on my “It’s a Date” Roll recipe. Store Coconut Sprinkles in a dark cool area and they should last until next Easter.